Three weeks of Bible readings help children and families focus on what Easter is really all about. 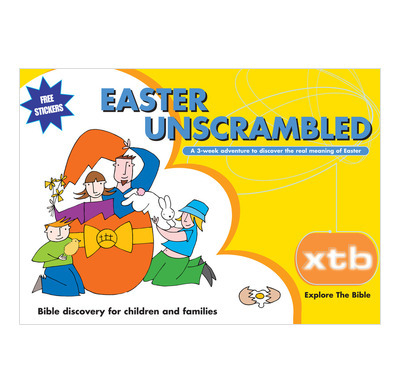 Easter Unscrambled is designed to help children and families explore the Bible together over the Easter holidays. Three weeks of Bible readings help you focus on what Easter is really all about. Meet Dr Luke as he tells you all about God's rescue plan. Find out Who the rescuer is and Why we need rescuing. XTB (eXplore The Bible) will help 7-11 year olds to get into the Bible for themselves. It's packed with pictures, puzzles and loads of help to follow the clues to see who Jesus is and why He came. Table Talk - is designed for families (or groups) to use together. Based on just a few verses from the passage that XTB uses, it is suitable for families with children aged from 4 upwards. Table Talk forms the basis for a short family time together - maybe just five minutes at the breakfast or diner table, or whenever best suits you. My 8 year old has really enjoyed doing these Bible readings, and is looking forward to getting more copies of XTB. These were given out to children in years 3-6 at our bible after school club as an Easter gift (with some chocolate eggs!). My children really enjoyed doing the activities each day and it encouraged them to use their bibles and pray independently. A great resource; well written and very engaging for this age-group. Thank you. I worked through Easter Unscrambled with my 2 children aged 7 & 10. It was a really great way of them re-visiting the Easter story. We had some brilliant discussions as a result of the studies. Just the right amount of reading and information in each one. Will use it again next year with the little one but will probably need something different for my older daughter. This is an excellent resource for our Youth Club (boys age 7-11) to learn about God's Salvation Plan and why Jesus had to die. They enjoy the puzzles and activities and it is a great way of introducing the Gospel to non Church families. This is an another excellent title in this series. Table Talk is an excellent and natural way to have a Bible study with out 5 year old, and our 9 year old (who has done the whole of Table Talk) now enjoys XTB. Great to have this in the run up to Easter and during the holidays to do with our 7 year old. We did this at breakfast time over the Easter holidays, it didn't quite tie in with Good Friday and Easter Sunday but was still a very good way of explaining Easter to my 7 and 5 year old, my 2 year old found it short enough to sit through without causing too much fuss. Even got the Grandparents involved whom we were visiting for part of it. I worked through this booklet with 2 of my daughters (age 5 and 7) in the run up to Easter this year. We had great fun looking through it and the studies were just about the right length, level etc. The combination of the 'table talk' material at the back and the studies at the front worked really well. The ABCD to following Jesus was really good and we looked at that several times on the way through. My only criticism and it's a bit pathetic really is that the shiny paper is almost impossible to write on - much frustration was had trying to find a biro that would work on the shiny paper! My 9 year old love the Xplore books and enjoyed completing this one on his own. He happily opens his bible in the evenings and reads it with Easter Unscrambled and even attempted to do a more than one study a night!